Comfort and convenience are the hallmarks of North York Foot Care Clinic's office operations. To ensure your convenience, below is the information you need about our hours, location, appointment scheduling, insurance acceptance and billing. You can request an appointment on our website or you can call our office during regular business hours and speak to our receptionist. After regular working hours, please leave a message and we will get back to you as soon as possible. We make every effort to see patients at their scheduled time and we would appreciate your consideration by notifying us if you are running late. Also, if you cannot keep a scheduled appointment at all, please call as soon as possible so that another patient can be scheduled for that time. Services are not covered by OHIP, however they are covered by most extended health insurance companies such as Manulife Financial, Blue Cross, Great West, Sunlife, Equitable Life, and Green Shield. In addition, Veteran Affairs Canada and the Ontario Disability Support Program (ODSP) cover most services. Your insurance should be checked prior to your appointment. If you require any assistance please contact our office and we will be happy to help you. Payment is expected at the time of service provided. Our fees are within the accepted fee schedule guidelines as set by the profession. We accept the following forms of payment: cash, cheque, VISA, MasterCard, and interact. Charges may apply for appointments canceled less than 24 hours before a scheduled appointment time. We take all safety procedures seriously to ensure all instruments are absolutely sterilized. 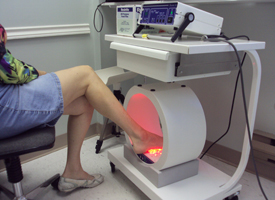 We use the most up to date technologies such as 3D scanning for orthotics, laser (G-Pulse) combined with pulsed magnetic therapy for heel pain, Achilles tendinitis, and wound healing. We also treat fungal toenails with the latest US FDA approved laser, and freeze warts with the very precise Cryoprobe unit. Whatever your problem is, we have the latest to deal with it.